Have you ever wanted to use an mini LED downlight but you could not find one small enough? 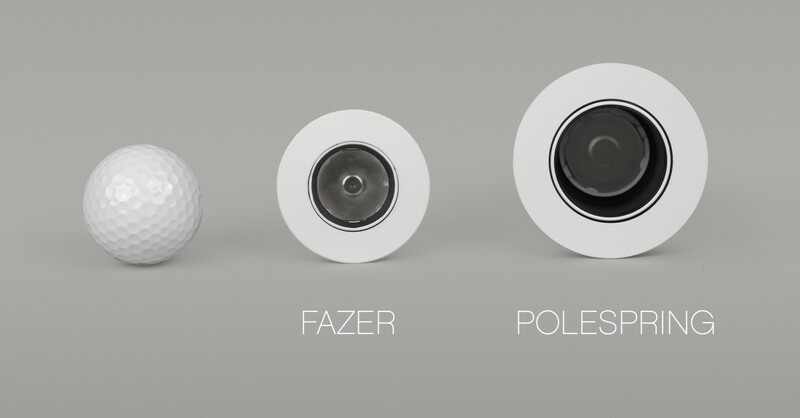 We are delighted to introduce the solution – our new mini marvel, the Fazer. Only slightly larger than a golf ball, it packs a punch with 245 Lumens (equivalent to 20W) whilst only using 4W of energy. This versatile mini LED directional downlight has a small bezel of 54mm and a recess depth of just 50mm so it can be fitted just about anywhere. The Fazer LED downlight produces excellent colour rendition (CRI 95) so your colours will look as they should. The fitting comes with a 25° tilt as well as a choice of narrow and wide beam widths so the light can be directed wherever you like in any room to suit your needs, from living rooms and bedrooms, to hallways and stairs. It is available in white, bronze and aluminium to suit your interiors. For full specification details of this mini LED downlight, click here. Alternatively visit the showroom to see them in a range of applications from cross lighting flowers, lighting artwork, washing the front of kitchen cupboards and lighting through glass shelves. |For an even smaller option, see the Luccini.